When attempting to encourage you to choose cosmetic dentistry, many dentists with either purchase stock photographs of before and after cases or download pictures from the internet. All the photographs you see here are the ACTUAL WORK OF DR. GARY MICHELS. Take a moment to flip through these incredible, life-changing photographs. 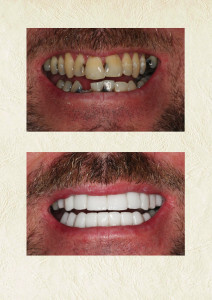 Dr. Michels has been changing the smiles and lives of patients wishing to improve their appearance for over thirty-five years. Cosmetic consultations are always free. Call us today and ask for our cosmetic consultation award of $100 credit toward any of our dental services! !